R.P.INDUSTRIES, an ISO 9001:2015 Certified Co., is a manufacturer, exporter and supplier of technical fabrics like Nonwoven Geotextile, Nonwoven Geobags, Wadding Fabric, Waterproofing Nonwoven Geotextile, Slitted Nonwovens, etc. We offer Nonwoven Geotextiles which are used worldwide for varried construction applications like Waterproofing, Landscaping, Dam Construction, Reinforcement, Filtration, Golf Construction, Acoustic , Sound Proofing, etc. These fabric are made from a GSM range of 80 to 3000 upto width of 6000 mm. We can even offer slitted fabric with a minimum width of 30 mm. We supply a comprehensive range of Nonwoven Geotextile for our customers. These Fabrics are used for the following applications: Drainage : Soil is Filtered in drainage application as the Soil Particles are retained through this fabric while free flow of water is allowed. Seperation and Stabilisation of Soil during construction of Roads and Railways Erosion Control Measures through prevention of soil movement Reinforcement : Protection of Containment areas through Cushioing application. 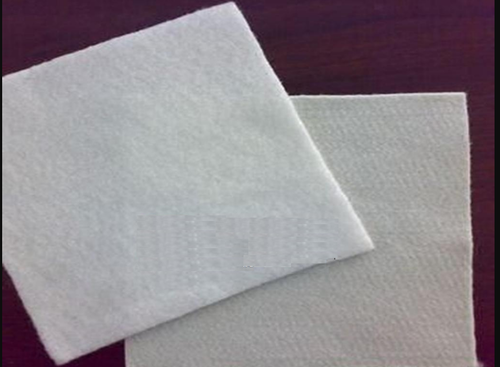 Filtration: These technical nonwovens are used as a filter media for Oil, Air, Water, Etc.